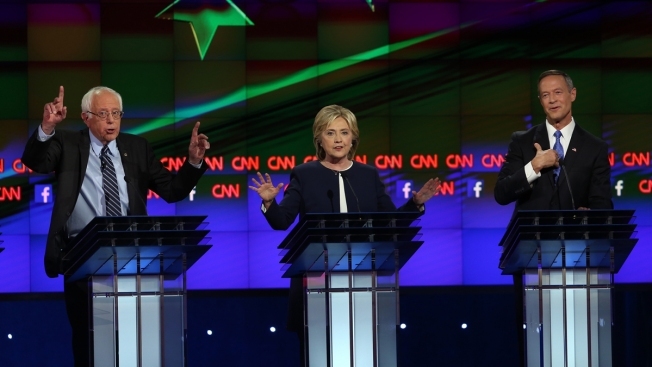 Presidential candidates Sen. Bernie Sanders (I-VT), Hillary Clinton and Martin O'Malley take part in the first Democratic presidential debate on October 13, 2015 in Las Vegas, Nevada. Democrats have dropped a New Hampshire television station as a debate sponsor over an ongoing disagreement between union workers and management. The Democratic National Committee and the New Hampshire Democratic Party said Friday they will not include WMUR-TV as a sponsor of the Dec. 19 debate and will bar its talent from participating because the station has been unwilling to schedule contract negotiations between its parent company and production department workers. "The right for workers to form and organize a union is a key principle of the Democratic Party, and is key to ensuring the economic safety of the American people by protecting their rights and benefits," said DNC Chair Rep. Debbie Wasserman Schultz and New Hampshire Democratic Party Chair Ray Buckley. The candidates also have weighed in. Hillary Clinton and Bernie Sanders asked station officials this fall to reach a contract before the debate, and Martin O'Malley called on candidates to stop advertising on WMUR until negotiations begin. The dispute goes back to April, when staff directors and production technicians unionized and began bargaining for raises and retirement plans. The union also represents photographers and satellite truck operators, and members had threatened to stage a picket line around the debate site. While union officials have said Hearst is unwilling to negotiate, WMUR general manager Jeff Bartlett said both sides agreed two weeks ago on their next meeting date. "We're disappointed that the efforts of the 140 WMUR employees in helping organize this debate will now be undone. Nevertheless, we'll continue to cover the debate, and the candidates and campaigns," he said. "As for the negotiations with this particular union, we will continue with the policy we've followed with the many prior union negotiations we've successfully concluded - to negotiate in good faith, and directly and not through third parties." Tom Brady for Vice President?